Bob grew up in a neighbourhood ironically called Craigentinny, on Vandeleur Avenue, close to the Royal High School's preparatory school where on the same day in October 1932 at the age of five he started school in the same class as Stu Eaton and Al Fairweather. The three remained friends and it was during the Second World War and in their 'teens' when the boys started listening to and playing jazz. They got together with Sandy Brown who was in the year below them. At various overlapping times each of them went away from Edinburgh to do their 'National Service' in the armed forces, and Bob took over from Al to play trombone in Sandy's band when Al changed to trumpet. Bob grew his 'trademark' handlebar moustache when he joined the RAF for his National Service. Sandy and Al left for London in the 1950’s, but Bob remained in Edinburgh. A modest man, he did not think he could compete at a national level and so formed his own band with others from the Royal High School. Bob went on to Edinburgh University where he gained his BSc degree, but rather than go into engineering, he worked for the Munrospun textile organisation in their marketing department, travelling agreat deal around the U.K. In later years took on a variety of jobs, including running a pub on the south side of the city. Bob never strayed far from the roots of the Louis Armstrong/ King Oliver style that he had adopted as a teenager, providing the hot, punchy chordal background against which other horn blowers could take off. Nevertheless, from time to time he would take a chorus or two of adventurous, original, solo improvisation that would astound his fellow musicians and the audience alike. His partnership with clarinettist Dave Paxton was particularly fruitful. Bob also played with other top Scottish bands including those of Charlie McNair and Mike Hart. When Al Fairweather returned to Edinburgh in the 1980’s, it was Bob wh o persuaded him to join Dave Paxton and himself in a band that did the club and pub rounds. 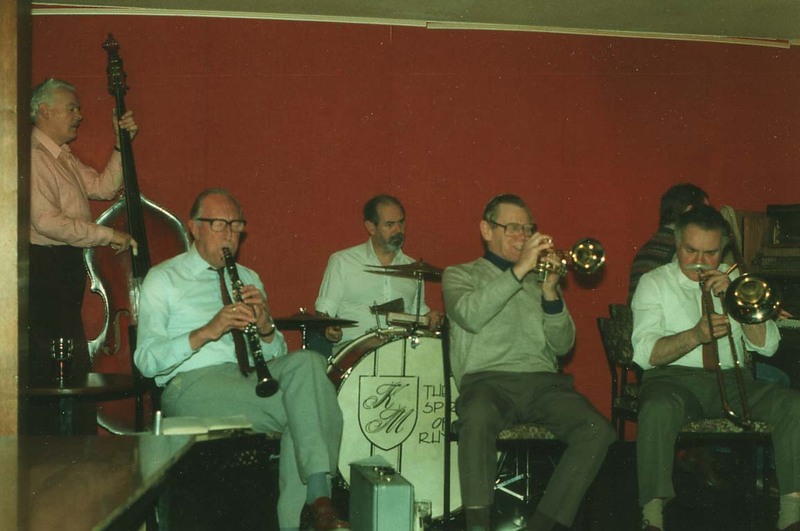 'Al Fairweather and Friends' had a regular Wednesday evening slot at Young's Hotel in Leamington Terrace playing the music that took them back to the Louis Armstrong roots that caught their interest in the first place. © Photograph courtesy of Stu Eaton. After Al and Dave died, Bob confined his playing largely to the Criterion Parade Band, where he had played in the front line for many years. He played with the Criterion Band at the Grassmarket for the 1998 Edinburgh Jazz Festival, only to suffer a heart attack the following day from which he never recovered. Bob died on the 4th August, 1998. Looking back, Stu Eaton said, "Bob was dearly loved by all. What we all had in common, apart from jazz, was a sense of foolish humour." Bob's wife Louise sadly died a few months later leaving two children Simon and Ann Louise. In writing a tribute to Bob in 'The Scotsman', Alastair Clark recalled how Bob encouraged him to take up the trumpet. Bob later invited Alastair to join his band and they toured packed venues during the height of the ‘Trad boom’. There was one occasion Alastair recalls when he was playing trumpet with Bob's band at the Condon Club in Edinburgh during the 1950's. Dave Paxton was on clarinet and they had just launched into a somewhat ambitious, largely solo version of Louis' 'Wild Man Blues'. "As I was playing, I spotted a familiar figure had just entered the room - Sandy. He was up from London for the weekend. My knees went to jelly. God was in the house! And the vibrato must have been something to behold. Later Bob and I stepped down so that Dave and Sandy could blow their clarinets with the rhythm section. A great session." Was Bob Craig A Painter? 'I have just read an article on the sandybrownjazz website about Bob Craig, a jazz musician from Edinburgh. The reason I came across this was that I was searching for a Robert Craig who painted a picture of Edinburgh signed 1968 and lived at 44 Vandeleur Avenue, Edinburgh. This seems to be the same person'. Bob Craig Junior never did anything except blow his trombone, make home-brewed beery whiskey and polish his priceless collection of 78s, which he would clean with black boot polish or some other devil's brew. However, when some shady characters broke into their house, guess what they stole? ...the records. Bob Craig Senior (also my dad) Robert Craig had a life of bad decisions. Firstly, he volunteered for the First World War by fudging his age, which taught him a lesson. When the Second World War broke out they nailed him for another six years, since he was just barely under forty years old, and he had already had enough of war. In the period between the two wars and starting from the bottom to the top my dad had practically owned the well known watering hole called Craig's Bar up the Bridges. This all went down the drain when my dad was away and conscientious objectors or shady characters were in charge and stealing all they could. My dad painted all his life but, due to the horrible weather in Scotland, he seemed to miss the sunny days and he would give away his good paintings to someone in the family. Later in life he became president of the Scottish Sketching Association and had a few paintings hung in the Royal Scottish Academy. Some of his best paintings were of two/three-masted sailing ships, which were in Edinburgh for some sailing event, and were instantly bought by the Lord Mayor of London. One of the ships was called The Winston Churchill.